Sherman was one of the most famous Union generals of the American Civil War. Sherman is best known for the ‘march to the sea&apos;, from Atlanta to Savannah, which played a crucial part in the final Confederate collapse, and for his close working relationship with U.S. Grant. He never commanded in a major Union victory and his military career had repeated ups and downs, but William T. Sherman is the second best known of Northern commanders. His father had died when he was nine years old, and Sherman was raised by Senator Thomas Ewing and eventually married into the family. Through the influence of his patron, he obtained an appointment to West Point. Only five cadets of the class of 1840 graduated ahead of him, and he was appointed to the artillery. He received a brevet for his services in California during the Mexican War but resigned in 1853 as a captain and commissary officer. Source: ";Photographic History of the Civil War"; Article by Walter L. Fleming, PH.D. The armies of the United States were led in 1864-65 by two generals, to whom, more than to any other military leaders, was due the final victory of the Northern forces. Both Grant and Sherman were Western men; both were somewhat unsuccessful in the early years of the war and attained success rather late; to both of them the great opportunity finally came, in 1863, in the successful movement which opened the Mississippi, and their rewards were the two highest commands in the Federal army and the personal direction of the two great masses of men which were to crush the life out of the weakening Confederacy. Grant was the chief and Sherman his lieutenant, but some military critics hold that the latter did more than his chief to bring the war to an end. They were friends and were closely associated in military matters after 1862; in temperament and in military methods each supplemented the other, and each enabled the other to push his plans to success. 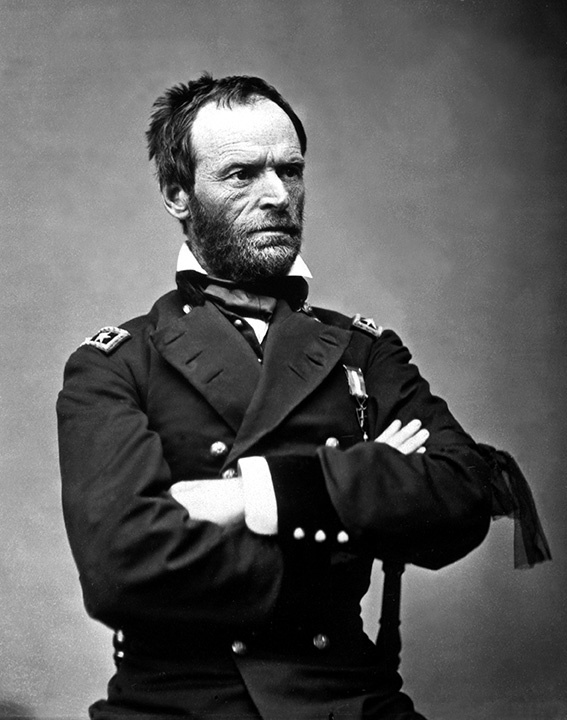 If the question was asked, &quot;Who was and still is the most hated and despised man in the history of Georgia&quot; the response would be William Tecumseh Sherman. From the onset of hostilities in the Atlanta Campaign on May 6, 1864 and the March to the Sea ending two days before Christmas 1864 with him capturing Savannah, no one created more destruction. As a result of his successful campaign in Georgia, the Confederacy was split in two and deprived of much needed supplies, ending the war quickly with a Union victory. He was born in Lancaster, Ohio on February 8, 1820. The son of a lawyer and jurist, his father died suddenly when William was only nine years old. One of eleven children, William was sent to the family of Thomas Ewing, who was a senator and a cabinet member, to be raised. Receiving his education in Ohio, he then went of West Point, obtaining an appointment through his foster father. He graduated sixth in his class in 1840, then was assigned to the 3rd Artillery at the rank of 2nd lieutenant. After spending a year here, he was sent to Florida where he was promoted to 1st lieutenant. In 1842 his assignments took him to Fort Moultrie, South Carolina. Sherman is the second best-known Union general, and arguably the most reviled, behind Grant and ahead of Ben Butler in each category. Civil War General, businessman, and author. General Sherman led an army of sixty-two thousand men with thirty-five thousand horses and twenty-five hundred wagons on an overland march to Savannah on a mission to punish the south for its secession from the union. He cut his army off from the union supply line allowing the troops to forage and sustain them self by feeding off the land. William Sherman, the son of a judge, was born in Lancaster, Ohio, on 8th February, 1820. He studied at the U.S. Military Academy at West Point and after joining the United States Army he was sent to Florida fight in the Seminole War. He was then transferred to California where he had a series of administrative post. William Tecumseh Sherman was born February 8, 1820, in Lancaster, OH. The son of Charles R. Sherman, a member of the Ohio Supreme Court, he was one of eleven children. Following his father&apos;s untimely death in 1829, Sherman was sent to live with the family of Thomas Ewing. A prominent Whig politician, Ewing served as a US Senator and later as the first Secretary of the Interior. Sherman would marry Ewing&apos;s daughter Eleanor in 1850. When he reached the age of sixteen, Ewing arranged an appointment for Sherman to West Point. Tecumseh Sherman was born in Lancaster, Ohio. His widowed mother sent him to be raised by another family; his foster mother added “William” as a first name. Sherman was named Tecumseh after the famous chief of the Shawnee tribe against whom his grandfather had fought while serving under General (and later President) William Henry Harrison at the Battle of Tippecanoe. His father, Judge Charles R. Sherman, died when he was 9 years old. Following this tragedy, Sherman was taken in and raised by a family friend, attorney Thomas Ewing, a prominent member of the Whig Party who served as a Senator from Ohio and as U.S. Secretary of the Interior. The name of William was bestowed upon him at this time when Ewing&apos;s wife, Maria, insisted Sherman be baptized Roman Catholic. He never truly accepted "William", however, and friends and family always called him "Cump". The American general William T. Sherman was born on the 8th of February 1820, at Lancaster, Ohio. He was descended from Edmond Sherman, who emigrated from England to the Massachusetts Bay Colony in 1634. His father, Charles R. Sherman, a judge of the Supreme Court of Ohio, died suddenly in 1829, leaving his widow with a family of young children. William was adopted by the Hon. Thomas Ewing, a close friend of the father, sometime a Senator of the United States and a member of the national cabinet. In 1836 he entered West Point, and on graduating near the head of his class he was appointed second lieutenant in the 3rd artillery regiment. His first field service was in Florida against the Seminole Indians. William Tecumseh Sherman was a Civil War general who is best remembered for his military tactical ability but also his &quot;scorched earth&quot; policy in the Civil War. In the course of the modern history of war, no other general or leader could compare to the sheer brilliance of Sherman&apos;s tactical maneuvers. One of America&apos;s greatest army officers was born February 8, 1820 at Lancaster, Ohio, and graduated from the U.S. Military Academy in 1840. William Tecumseh Sherman is the U.S. Civil War general who famously said, "war is hell" -- and proved it with a destructive campaign through the South that burned the cities of Atlanta, Georgia and Columbia, South Carolina. A graduate of the military academy at West Point (1840), Sherman served without distinction during the Mexican War and, as a young lieutenant, was sent by President James Polk to report on California&apos;s gold rush (1847). William Tecumseh Sherman was born on February 8, 1820, in the town of Lancaster, the county-seat of that fair and fertile section known as Fairfield County, in the southern part of the State of Ohio--the busy commonwealth that furnished 300,000 men to the armies of the Union, and gave to the Civil War its three greatest generals; for Grant and Sherman were Ohio born, and Sheridan&apos;s boyhood was spent in the same State. Nearly ten years have passed since the close of the civil war in America, and yet no satisfactory history thereof is accessible to the public; nor should any be attempted until the Government has published, and placed within the reach of students, the abundant materials that are buried in the War Department at Washington. These are in process of compilation; but, at the rate of progress for the past ten years, it is probable that a new century will come before they are published and circulated, with full indexes to enable the historian to make a judicious selection of materials. Most famous for his scorched-earth tactics in the Civil War, General William Tecumseh Sherman brought that same military philosophy to the West, where he shaped a policy and strategy that would finally subjugate all the native peoples of the plains. Sherman was born in Ohio in 1820 and named after the Shawnee chief Tecumseh, who had tried unsuccessfully in the first decade of the nineteenth century to unite the tribes of the Ohio River Valley against American intrusions on their land. When his father died in 1829, Sherman was raised by a family friend. William Tecumseh Sherman, United States Army officer, was born in Lancaster, Ohio, on February 8, 1820, the son of Charles Robert and Mary (Hoyt) Sherman. His father was a justice of the Ohio Supreme Court. With the death of the elder Sherman in 1829, William became the ward of Senator Thomas Ewing, secretary of the treasury in the William Henry Harrison and John Tyler administrations and secretary of the interior in the Zachary Taylor administration. With Ewing&apos;s influence, Sherman was appointed to the United States Military Academy at West Point on July 1, 1836; he graduated sixth in his class and received a commission as a second lieutenant in the Third Artillery in Florida on July 1, 1840. Roughly seven months after the fall of Vicksburg, Major General William Tecumseh Sherman took his army across central Mississippi, intent on undermining that region&apos;s ability to wage war. His military target was the rail center of Meridian, but Sherman&apos;s troops tore up railroad tracks and burned military stores all along their route. This was typical of armies marching through enemy territory in the Civil War. General William T. Sherman, U.S.A.
General William T. Sherman was born in Ohio February 8, 1820, and graduated from the Military Academy July 1, 1840. He was promoted second lieutenant Third Artillery the same day, and first lieutenant November 30, 1841. He served in the Florida War, 1840-41; on duty in various Southern States and in Pennsylvania, 1842-46; on breaking out of war with Mexico applied for duty in the field, and was assigned to Company F, Third Artillery, then under orders for California; he was bearer of dispatches from General Smith to War Department, and, after six months leave of absence, joined Company C, Third Artillery, at Jefferson Barracks, Missouri. He was appointed captain and commissary of subsistence September 27, 1850, and stationed at St. Louis and New Orleans, but resigned from the army September 6, 1853, and entered upon a civil career as a banker in San Francisco and New York until 1857; was major-general of California Militia in 1856; counsellor-at-law at Leavenworth, Kansas, 1858-9; superintendent of the La. State Seminary of Learning and Military Academy, 1859-61. Source: Lt. Gen. Wade Hampton Camp No. 273 Columbia, S.C. The surrender of General Joseph E. Johnston&apos;s Confederate Army to General William T. Sherman at the Bennett Place, April 26, 1865, was the second and last major stage in the peace making process which ended the War Between the States. General Lee&apos;s surrender at Appomattox 17 days earlier was the first. The capitulation of General Richard A. Taylor&apos;s small force in Alabama a week later and of Kirby Smith&apos;s Trans-Mississippi Army at New Orleans exactly a month later concluded the process.